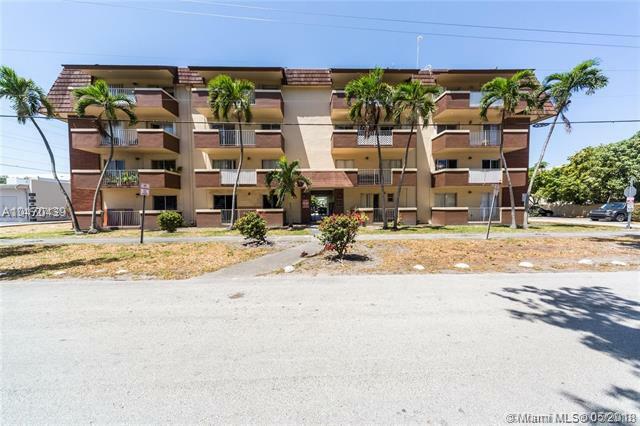 This 2 bedroom/1.5 bathroom apartment in Miami Springs is simply beautiful! Located on the third floor, it is accessible by both stairs and elevator; the property is exceptionally well-maintained. The apartment, which comprises 816 square feet, is one story. Enter through the front door and walk through a short hallway to see the beautiful kitchen and family room. Recently remodeled, the kitchen has an abundance of beautiful wood cabinets with modern metal drawer and cabinet pulls. All appliances, including the refrigerator, oven, microwave and dishwasher are stainless steel, as is the double kitchen sink, complete with a built-in soap dispenser. The sink is large and contains a new garbage disposal. Perhaps the highlight of this magnificent kitchen is the granite countertops and backsplash. The kitchen was recently remodeled, and the countertops were extended to create a bar-like dining space. This area contains contemporary overhead pendant lights completing a modern and airy design. The family room, next to the kitchen, adds to the living area’s airy and open feel. The proximity of these two rooms encourages conversation and family time. One person can cook while others relax at the dining bar or on the family room couch. It is a lovely area in which to spend time. The two bedrooms are located down a small hallway. Both are well-lit and have in-room closets. One bedroom is home to the apartment’s half bath; a beautifully designed space with new tile, ceramic borders and multiple storage areas. Located in the hallway, the full bathroom has clean lines and a distinctly modern look. Completed in earth tones with a large marble shower with both overhead and handheld faucets and glass doors; the bathroom can only be described as luxurious. A modern dark wood vanity houses a white ceramic vessel sink and a contemporary single hole faucet. The bathroom is accented with a glass tile border. A linen closet is located in the hallway for additional storage. The apartment is complete with a large balcony which borders one complete side of the living area. Access to the balcony is available from one of the bedrooms and the family room. It is a lovely spot to enjoy your morning coffee or read a book. The entire apartment has Italian compressed porcelain tile, all new electrical wiring and PVC plumbing. It has been meticulously maintain and is in move-in condition.